Comments: An upbeat conclusion to an interesting series. Case File VI, the sixth disc of Pioneer's release of Famous Detective Sherlock Holmes (titled Sherlock Hound in English) concludes the series, in which Hayao Miyazaki (of My Neighbor Totoro and Spirited Away) played a major role early on. 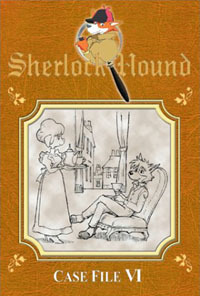 Sherlock Hound features the world of Conan-Doyle's Sherlock Holmes, populated with dogs. While it's not the most exciting series in anime fandom, it is a charming little series that children and some adults will like. Case File VI features the last several last episodes, 23 through 26 of the series. All the major players make their return; the loyal Watson, the cunning Professor Moriarty and his side-kicks Todd and Smiley, the bumbling Inspector Lestrade (and the entire London police force), and of course the famous detective himself. Episode 23, The Secret of the Parrot features Holmes and Watson tracking down a parrot from India. The parrot is the key to unlocking one of Britain's most important secrets and, of course, keeping it out of the hands of the wily Moriarty. In episode 24, The Bell of Big Ben Moriarty steals Britain's most recognizable symbol, the bell from Big Ben. It's up to Holmes to trick Moriarty into giving it back. The Priceless French Doll has Moriarty, Todd, and Smiley (the latter two in drag) dupe a jeweler so that they can steal a valuable diamond. However, things go awry when Moriarty uses a girl's doll to hide the diamond in. The thieving trio gets more than they bargain for when they run into the girl's nursemaid. Finally, in episode 26 The Missing Bride Affair (titled Sayonara Holmes! The Last Case in Japanese) Holmes helps true love find its way in the star crossed relationship of a British businessman's daughter and an Indian prince. This disc seems much more upbeat and engaging than the last couple of discs. While the first two discs are the best of the series (more of a Miyazaki-esque vision is apparent in those earlier discs and the series is far fresher), disc six is a fun romp. It's nothing particularly intellectual, but it's childhood fun and less patronizing than children's' cartoons today. Technically, the DVD animation is good. While the character designs seem a little primitive by today's standards, it is still charming. The backdrops of old London buildings are gorgeous and are reminiscent of Miyzaki's Lupin III: Castle of Cagliostro and Laputa. The music is pretty, though a little limited throughout the series; there aren't a lot of themes and they're used throughout the series. The opening and closing themes are very catchy. Throughout the series' release, the DVD cases have been subtle but charming (much like the series) and the final disc is no exception, featuring some pastel colors and a line art drawing on the middle of the case. The back of the case remains as lackluster and boring (that truly is one of the most clichéd blurbs I've ever seen on a DVD). As for extras, the disc has a conceptual art gallery, but that's it. The lack of bonuses is a shame, especially considering this is the final disc in the series. Sherlock Hound is a fun romp for children and even some adults. The series is exciting and fun, without being in your face or featuring mind numbingly day-glow colors. That alone should earn the series a place in the video collection of many young people. As one of Miyazaki's earliest works, his fans will also be interested to see the series, as many concepts in this work (various cars, European settings, strong women) reappear in his later work. Though this is the last disc in the series, there is some hope of seeing the detective in action one more time; there is a chance that the original Famous Detective Sherlock Holmes movie, created before the series and which Miyazaki was highly involved with, will see the light of day in America. I for one am eager to see this movie and would be delighted if Pioneer gave Holmes another run.